A PHANTOM hovers high above the valley, an eerie white shape on the crest of a ridge. It writhes and it screams but its torment is lost on the wind. At the point where the gritstone escarpment meets the sky, the apparition dances like the rags of a ghostly banner – pale and weird; a soul trapped in the wrong world. In more superstitious times, the apparition would have been regarded with dread. Men would have glanced up from their fields and seen this spirit on the ridge, then repaired hastily to their homes. A phantom on the fell – not a good omen that. Milk would have turned sour, blood flowed from stones, and somewhere near Tebay a woman would have given birth to a goat. In this valley of legends, where Uther Pendragon built his castle and attempted to divert the River Eden, nothing is as it seems. There is always a sense that the Otherworld is close – just beneath the surface of a pool, perhaps, or in the shadow of a rock, or in the hollows beneath the roots of a tree where occasionally water can be heard to flow. And high on this ridge, a phantom dances. I can see it. It’s wild and it’s white, and I can’t explain what it is. 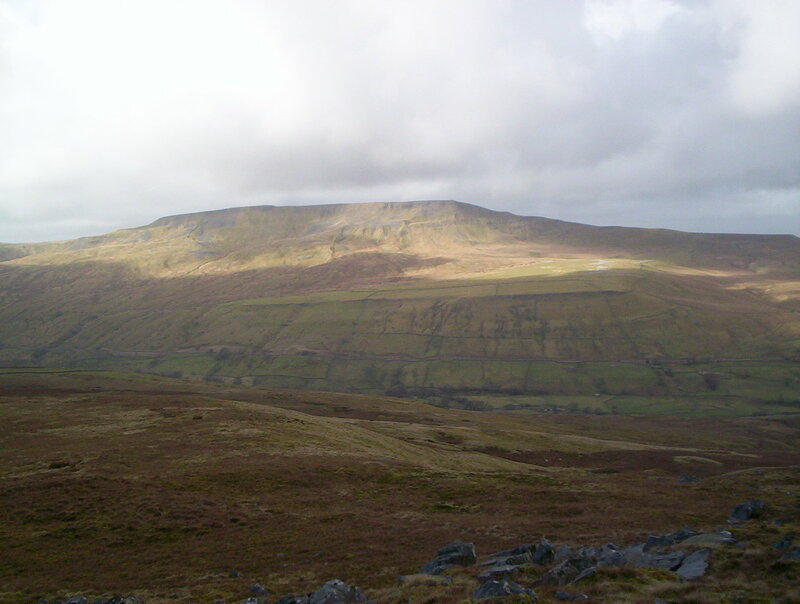 So I climb like a madman with the wind behind me, up The Riggs to Black Fell Moss and Huntingstones Scar, with the Mallerstang Gorge beneath my feet and the great mass of Wild Boar Fell glowering in the west (pictured above). The wind shrieks over Mallerstang Edge, absolutely blasting acr oss the fell and as cold as ice. And in this place I encounter the phantom. It’s one of the strangest things I have ever seen. 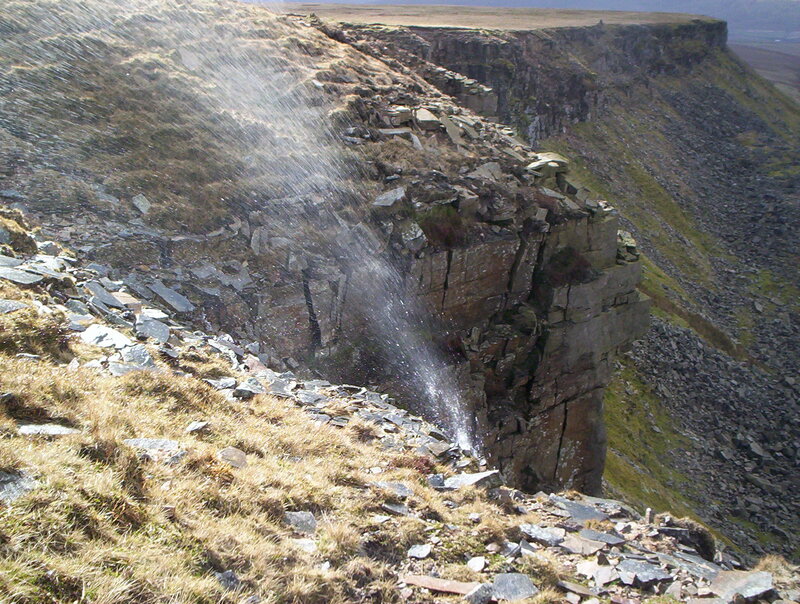 A waterfall is being blown into the air above the escarpment. The wind is so strong and so constant, not a single drop of the stream is following its natural course over the edge of the crag. It is being lifted in its entirety and blasted back across the fell. Like Sir Gawain I wander on, amazed by what I have seen. What else will I chance upon, I wonder? An enchanted grove? A poisoned apple? The Green Knight? A table laden with fresh fruit and a roasted goose? On the top of High Seat (709 metres) the wind is brutal and I don’t hang about – not even to drink from a golden chalice overflowing with wine that I find behind a rock. A couple of miles north and I am on High Pike. I drop down to an old quarry, which appears to have been a source for gritstone, perhaps producing tiles. There is scattering of roofless buildings, similar to the ruins found in the abandoned slate quarries of the Lakeland fells, and, curiously, a magnificent cairn. The cairn is about 12ft high and is almost perpendicular, similar to – though much higher than – the curious marker cairns on Baugh Fell and neighbouring Wild Boa r Fell. This one, though, has slabs protruding from its sides to form a precarious spiral stairway. Some of the steps are missing, one or two have snapped off to leave only stubs, but there is sufficient to allow me to scramble up. I trudge a mile south across the fell to a bit of a crag, then follow Gale Sike down to Castlethwaite and the remains of Pendragon Castle. Despite its Arthurian name, historians maintain it was in fact built by the Normans in the 11th Century then extended in the 14th. I poke about in the ruins and find a sword sticking out of an anvil. It slides out quite easily, so I strap it to my rucksack and wander back to the car for a pan of tea and some home-made carrot soup. That night, on the local news, Pam Royle says that a woman near Tebay has given birth to a goat. All in all quite a bewildering day. This entry was posted in Climbing, Hiking, Walking and tagged Pennines. Bookmark the permalink.